Swiss Made featuring a Sellita Caliber SW200-1 3-hand automatic with date. 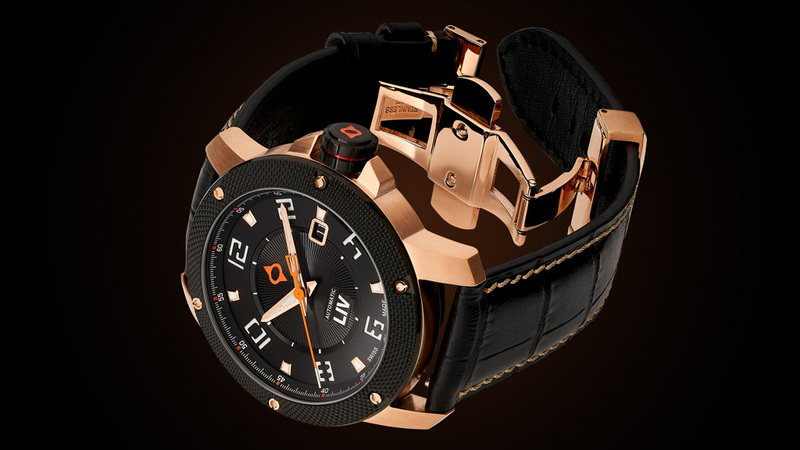 "Superb GX1-A automatic in rose gold exudes a sporting confidence combined with dress style. One of the few very reasonably priced modern automatic watches which looks as though it belongs in the 21st rather than 20th century. Solid Swiss build and impressive quality would not be out of place on a piece three or four times the price. One to be treasured." - Ian G. from the U.K. This timeless design disguises a radical approach to Swiss watchmaking. Scour the horological world for top Swiss movements and the same high-quality materials the big-name brands use. Let passionate, skilled Swiss watchmakers bring them together with insane attention to detail. Then sell direct to fans at unheard of prices. You have described the GX1-A and LIV’s approach to the watch business. The Sellita SW200-1 movement with its 3-hand and date display of time may appear basic. However, it is anything but. The fantastic movement uses 26 jewels, more than some of the most chronograph movements for smooth operation and accuracy. A hand finished solid 316L stainless steel case cradles and protects it. An intricate 3D multi-layer dial draws the eye to your watch. High grade anti-reflective sapphire crystals front and back provide a crystal-clear view of the functions of time and movement. Secure it to the wrist with a range of straps and bracelets carefully crafted from premium materials. Rugged, timeless, and steadfast, the GX1-A with last a lifetime, and more. Swiss quality as it should be. Hard to belive that you can get so much for so less. I thought owing a Swiss made watch will drain my account... and then I found LIV. I was a little skeptical in the beginning, but once I received my GX1-A I understood that I took the right decision. I got an amazingly looking watch, Swiss quality, for a very decent price. I have only one issue with the watch, my wife likes it as much as I do.... and that means I have to buy another one. Thank you LIV for making it possible, we'll definitely cross paths again. Superb GX1-A automatic in rose gold exudes a sporting confidence combined with dress style. One of the few very reasonably priced modern automatic watches which looks as though it belongs in the 21st rather than 20th century. Solid Swiss build and impressive quality would not be out of place on a piece three or four times the price. One to be treasured. My Son Loves The LIV AUTO! My son loves the LIV AUTOMATIC and that's what really matters to me! Keep on building beauties! Fantastic job!. Love the look and automatic movement. Classy all around. I can't put into words how good this looks AND feels. Pictures don't do it justice at all. So many people have complimented me on my watch since getting it,and it goes great with both the rubber and the metal strap. 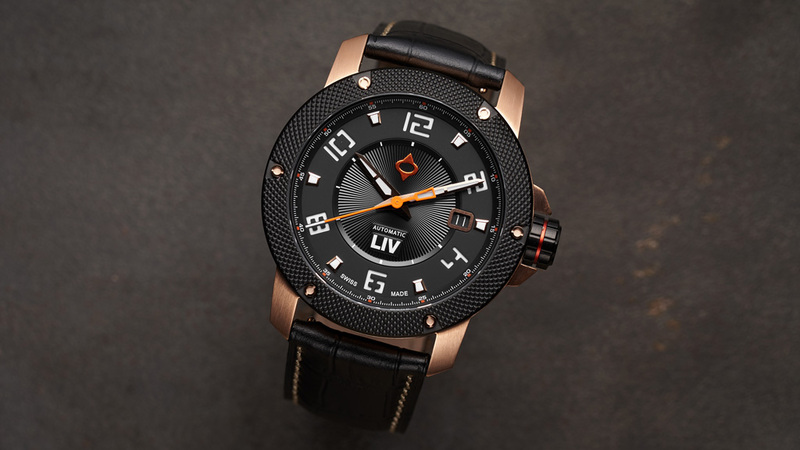 Can't wait to see what watch designs LIV come up with next! I got mine with stainless steel and tan suede straps. Been getting a lot of compliments -- both at work and at the beach! I wear it almost daily as I never seem to get tired looking at the blue 3-D dial's high quality finish. The color is just superb and the textured sunburst of the inner dial provides an additional understated but handsome shimmer. 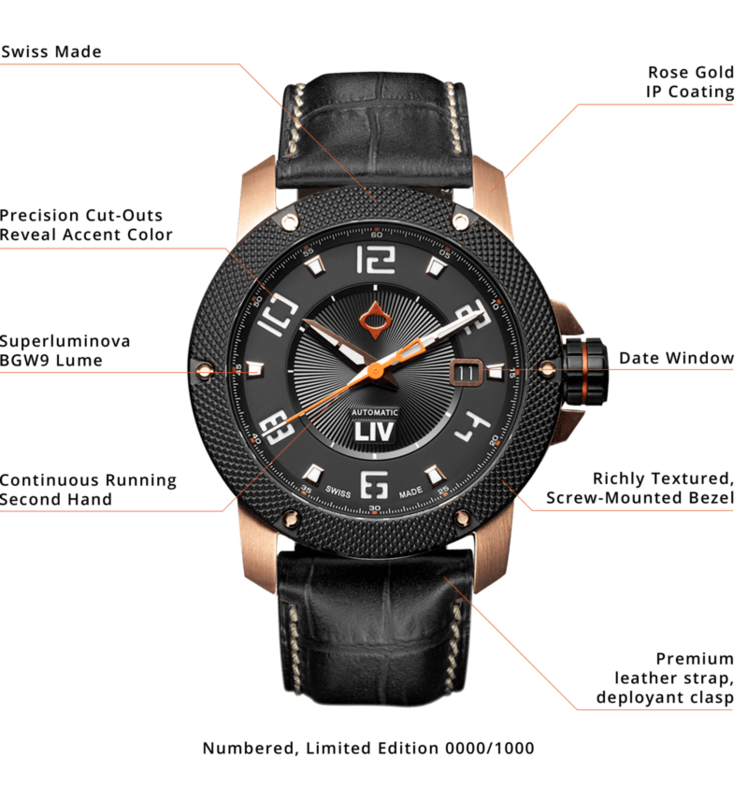 The orange Liv logo and the orange second hand that sweeps around the provide a gorgeous contrast to the rich blue dial. The multi-color ensemble is completed with the black bezel and stainless steel lugs - it just works! Apart from the great attention to detail, the build is quite solid and had held up quite well in and out of the water. 5-stars for this timepiece! First my experience buying: um WOW!! I bought it through the chat feature and the sale was a breeze. The watch wasn't going to ship until beginning of December, since it wasn't available yet, but they were so sweet to allow me to purchase pronto. When it shipped I received an update, and continued email updates regarding the location, so my anticipation was built up beautifully. It was my fiancés Christmas present, and it blew him away. What a beautiful watch!! It is solid in appearance, looks rugged and tough, but beautifully crafted like an art piece. He had bought a Russian something or other watch to be his tough guy watch, but when he saw this GX1-A, well, sorry Russian watch, you're history. He has been showing it off, not that he needs to, it is an eye catcher. We love it. Thank you to LIV, I would recommend this company in a heartbeat! !